Gale’s Research In Context is a cross-disciplinary resource targeted to Middle Schoolers and supportive to the other ends of the K-12 spectrum spanning literature, science, social studies, and U.S. and world history. Students in grades 6 to 8 will benefit from an interface that delivers the highly visual design and navigation preferred by younger users combined with the authoritative content and user-focused tool set needed to support middle school assignments and coursework. 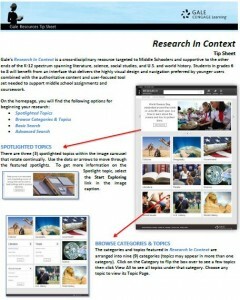 Learn more about how to use Research In Context with this handy Tip Sheet from Gale. Access this and all of our other Gale products by visiting elportalnm.org or thru your library’s own access point on your webpage.